Architectural style in Hertfordshire churches. Fonts, glass, woodwork and tiles in Hertfordshire churches. St. Peter and St. Paul, Little Gaddesden. A red lady and a rosy witch. The church sits like a model on a track running into parkland where sheep graze beneath beech and oak, scattered outliers of the woods that hide the gothick pile of Ashridge up in the hills. The village clusters around the gates of the estate, a mix of grand old brick and timber and even grander Victorian copies amongst the tied cottages built for some of the 800 farm workers and servants of the Earls of Bridgewater. Close to the Georgian inn that bears their arms lies Witchcraft Bottom, named after Rosina Massey who was known to fly about on a hurdle, and to have killed a gamekeeper on the spot with witchcraft. Now new housing covers part of the park, the name has magically changed to Faerie Hollow. Although there was a church here in Norman times, as it stands it is mostly a child of palatial Ashridge, the same architects working on both throughout the nineteenth century. James Wyatt built the south aisle in 1812, his nephew Jeffrey Wyatville adding the south east chapel in 1819. The rest of the church was rebuilt towards the end of the century, leaving untouched only the north arcade and tower doorway, which has angels carved in the spandrels. The Earls made of the church a family mausoleum, filling it up with tablets and tombs. The grandest monuments are crammed into the north aisle, a sure sign that Victorian distaste has moved them from the chancel. Two are for Countesses of Bridgewater and family members, erected in late Stuart times to list a generation who died in the Interregnum, their remembrance delayed until the monarchy’s restoration. Apart from classical columns both gloomy lists rely on heraldic achievements for decoration; over in the opposite aisle the Red Lady kneels in a scarlet farthingale with her hair piled high, Father Time swinging a scythe over her head. This is Elizabeth Dutton in her Jacobean finery, buried in St. Martin in the Fields, the memorial brought here when that church was rebuilt. 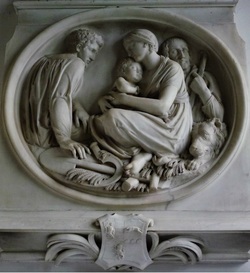 Below her monument stands the late Victorian pulpit with baroque fragments affixed, each side carved with angels of the Creation that are some way from the original Burne-Jones design. 1633 mourning cherub on Bridgewater tomb. The chancel got the full late Victorian make over: dark, rich and high in fading splendour, the screen and stalls reusing original fragments. The south wall has late mediaeval windows, now opening unglazed into Wyatville’s chapel. He repeated them in his external wall, and vaulted the ceiling with gilded ribs and bosses. The walls are a gallery of funerary art, with a particularly good roundel over the altar of a farmhand and family resting at work. 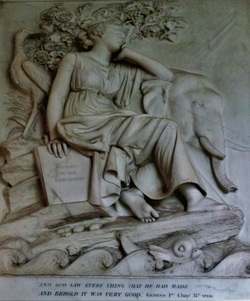 This was carved by Sir Richard Westmacott in 1823 for the 7th Earl’s memorial; the 8th Earl died six years later and has a plaque showing a Grecian woman seated between an elephant and an egret contemplating fish at her feet. The inscription notes a bequest left to reward writers whose works prove the benevolence of God in the works of the creation, just thirty years before Charles Darwin made such works obsolete. A 1669 memorial to Elizabeth Viscountess Brackley has two cherubs holding a sheet with the epitaph written on it in several beautiful fonts, each part of speech rendered in differing lettering like a calligrapher’s exemplar; two putti standing on a gadrooned shelf present the epitaph of 14 year old Henry Stanley, carved by the eccentric sculptor James Bushnell in 1670. There is no stained glass in the side chapel, but the church is quite dark with work by Burlisson and Grylls in a German Renaissance style, and two windows by Charles Kempe overlook the Wyatt font. In the north aisle is the only old glass, a sixteenth century French Madonna once part of the enormous hoard that filled Ashridge, its dispersal flinging foreign fragments into lucky local churches. A cold atmosphere, but always open. Local wardens are on 01442 843613 and 01442 843591. 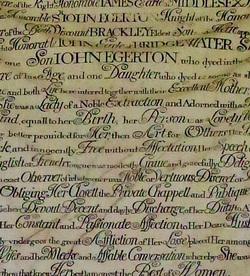 1669 lettering on the Brackley memorial. All rights reserved for this entire site. Copyright reserved to stiffleaf for all text and images, which may not be reproduced without my permission.